Living as a Christian for them was difficult. They chose to do the right thing instead of the easy thing. Would you give in or would you resist? Blandina became a Christian and then a martyr; Perpetua was forced to give up her child and then died in a Roman amphitheatre; Lady Jane Grey did as she was told but in the end would not deny her Lord; Anne Askew lost her home and family but never lost her faith; Lysken Dirks loved her young husband but they both loved Jesus first; Marion Harvey discovered the joy of following Christ and followed him to the end; Margaret Wilson became an outlaw for Jesus but obeyed God whatever the cost; Judith Weinberg loved the Lord although it cost her life; Betty Stam's life was full of danger but she lived for Jesus through and through; Esther John gave her life to Christ and died for him. In a world where we give in too easily - be inspired by those who didn't! 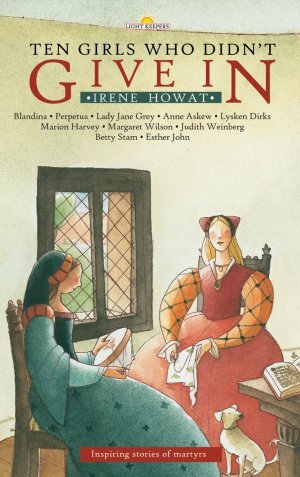 Ten Girls Who Didn't Give In by Irene Howat was published by Christian Focus Publications in February 2005 and is our 14th best seller. The ISBN for Ten Girls Who Didn't Give In is 9781845500368. Bought as a present. Will have to wait until the granddaughter reads it before I know how it is received. Birthday not till August!!! Got a question? No problem! Just click here to ask us about Ten Girls Who Didn't Give In. One little girl read these stories and wondered about how these girls could be so brave! That is what hits you in the face when you read about these characters - their courage, their uncompromising stance for God's truth and the God who gave them that truth in the first place. At a time when young christians around the world know what real persecution is, help your child to understand that not compromising is something that they can do. Irene Howat writes with a real warmth and insight. In a world where role models of real integrity are few and far between the Lightkeeper's series fills the gap! This book is a mixture of exciting, sad and challenging testimonies. I enjoyed reading about Blandina, Perpetua, Lady Jane Grey, Anna Askew, Lysken Dirks, Marian Harvey, Margaret Wilson, Judith Werghburg, Betty Stam and Esther John. These women loved their saviour and lived their lives which emulated Christ in many practical ways. I found this challenging because it made me think that I should stand out and tell people about God and not to have the fear of man but rather to have the first fear of man but rather to have first the fear of God. Life can be hard being a Christian at home or school, but with the Lord's strength and grace he enables us to shine forth as his light. I recommend this book to everyone, including Mums & Dads.